In a world where hunger and poverty are issues with a large percentage of the population, technology and education are wanting, and agricultural resources are often scarce, a farmer is thankful for low-maintenance crops that will grow with a minimal input of effort and resources. 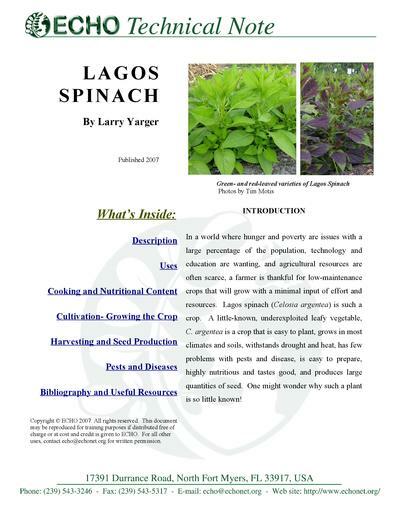 Lagos spinach (Celosia argentea) is such a crop. A little-known, underexploited leafy vegetable, C. argentea is a crop that is easy to plant, grows in most climates and soils, withstands drought and heat, has few problems with pests and disease, is easy to prepare, highly nutritious and tastes good, and produces large quantities of seed. One might wonder why such a plant is so little known!